Social media is quickly becoming the most frequent source of news for citizens of the U.S., which has sparked a nationwide lack of accuracy and detail. The term “fake news” was only introduced a year ago, and yet it is turning into a legitimate concern even at the local level of government. With Facebook and Twitter as the primary sources of information, how can residents be sure they are receiving the complete, objective truth? Michael Manion, the director of community relations in Southfield, Mich., weighed in on the matter, expressing a preference of proactive media in the face of rumors. 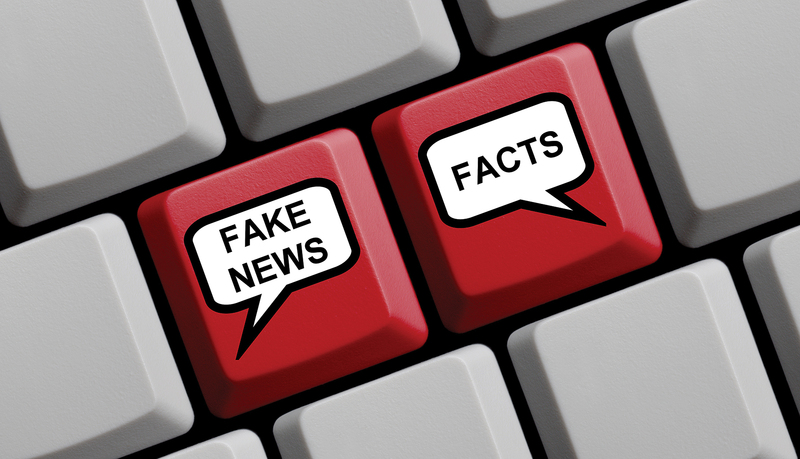 According to Manion, making information accessible before the miscommunication starts is the best way to avoid “fake news.” When rumors do circulate, the city chooses to address them directly both on social media and on local news websites, channels and press releases. 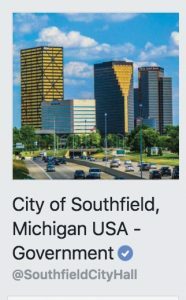 Manion oversees four social media platforms for the city of Southfield: Facebook, Twitter, LinkedIn and Instagram. Facebook receives the most traffic online and is the most active form of social media the city runs. Manion said that Facebook is a great tool for the city that is cost effective for communicating with residents. This sentiment was shared with Chief Communications Officer Toni Bankston of Dayton, Ohio. She leads a team of five that manages accounts on Facebook, Twitter, Instagram, and NextDoor—a private social networking site intended for neighborhood communication. Dayton previously ran separate Facebook accounts for each city department — parks and recreation, utilities, etc. — but the city manager recently decided to disband each account in order to consolidate all the different branches and provide one cohesive story. 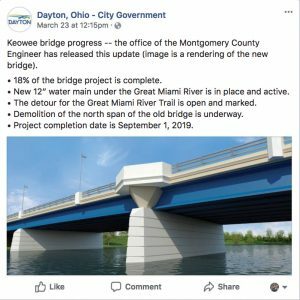 The Dayton social media accounts have accrued a combined total of more than 30,000 followers, often using social media to connect with residents and create dialogue. Bankston went on to say that the community relations department in Dayton even creates its own videos that address rumors and clarify any confusing information. Where Manion and Bankston found success in combining all the departments on one community Facebook and Twitter page, other communities prefer separate pages. Columbia, Mo., is one such example. The community operates a little differently than others — it is a “full service” town, which means many departments that are typically provided privately, or at least separately, are all under the umbrella of the city government. These departments include a city airport, police, sewage treatment plant, water company, electric company and more. Brian Adkisson, the communication and marketing manager of the town, said that this is why they choose to provide separate pages for each entity. Their strategy for addressing false information depends widely on the department and platform. Each page has a different demographic of users. Facebook is used primarily for announcements and general information. The communications team consists of 12 or more members working on an extensive roster of social media platforms. The overall strategy when faced with rumors or fake news is to respond to the confusion with a clarified press release, announcement or physical notice circulated to those involved. For example, Adkisson said, they sometimes put hang-tags on doors of those affected by a water-related issue in addition to posting something on the water company Facebook page. When clarity is needed more immediately, Columbia oftentimes uses Twitter. The type of information, the target audience, the level of urgency and the account used are all factors. “You have to look at each (story) really individually and figure out who is your audience and what is the best way to communicate and engage with that audience,” he said. Where Columbia decided to specialize each social media page, Dayton prefers to streamline. All three of these community relations representatives agreed that government positions require as much transparency as possible, and social media works well in offering the public the truth more than stirring up misinformation.